When you are in the Meramec Region, you are at the center of everywhere, and there are plenty of transportation resources to get you wherever you want to go. Interstate 44 runs through the heart of the region, making receipt and delivery of products and materials a cinch. Rolla is about the midpoint in I-44’s St. Louis to Springfield stretch. Supporting Interstate 44 is U.S. 63, running north and south, and U.S. 50, running east and west along the region’s northern reaches. Further supporting this system are several connector roads, such as Highways 72, 28, 68, 19 and 8. An abundance of truck lines are located in the region to make sure your products reach their destination. Airways are also an option in the Meramec Region. The Waynesville-St. Robert Regional Airport at Forney Field in Pulaski County is located on the Fort Leonard Wood military base, yet is accessible to the public. The airport is the only one in the region featuring an air traffic control tower. Mile-long runways can be found at Rolla National Airport, located at Vichy and owned by the city of Rolla. A former World War II training base, this airport sits on 1,300 acres of prairie and is bordered by three highways, making it a prime industrial site. Both the Rolla National Airport and the Sullivan Airport are defined as B-2 airports and are used primarily by airplanes with approach speeds up to 120 knots and wingspans up to 79 feet. The region also has five other publicly owned airports – Washington County, Salem, Cuba, Hermann and Linn. These airports serve planes with approach speeds up to 120 knots and wingspans up to 49 feet. 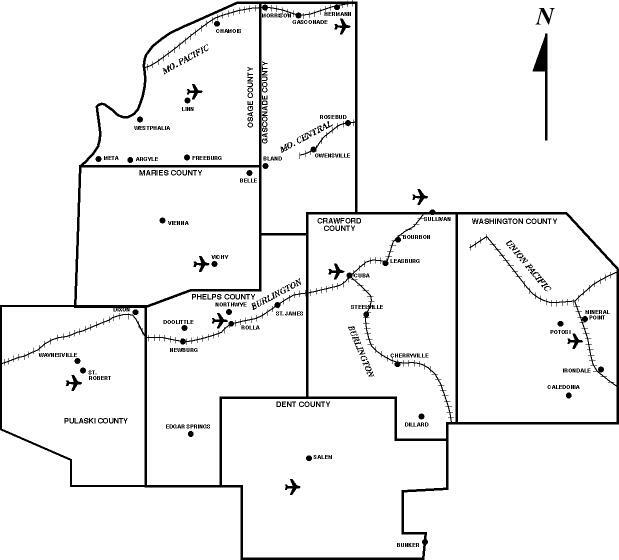 Six privately owned airports can also be found in the region. If your business demands rail service, Burlington Northern Santa Fe, Union Pacific and Missouri Pacific run rails across the Meramec Region. 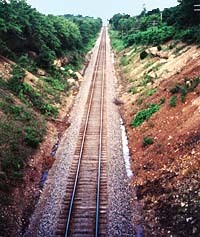 Burlington Northern Santa Fe operates the most miles of track in the region and generally follows Interstate 44 through Crawford, Phelps and Pulaski counties. The Missouri River also provides opportunities for moving goods. Navigable water transportation is provided in three locations along the Missouri at Hermann, Gasconade and Chamois. For passenger service, Amtrak makes four daily stops in Hermann. Bus service and cab companies also serve the region. Once the goods and services are delivered, you can take advantage of the more relaxing transportation resources—such as hiking, bicycling, horseback riding and canoeing. There are plenty of country roads, bike trails and meandering rivers and streams to enjoy on your favorite mode of transportation. And don’t forget to get your kicks on Route 66, the Mother Road, which nearly parallels Interstate 44. You can spend a leisurely afternoon on a self-guided tour of Route 66 across Pulaski, Phelps, and Crawford counties where you can see vintage architecture of times past. There are plenty of opportunities to stop along the way to find that perfect piece of Route 66 memorabilia. If you want to find out more about Missouri’s transportation system, log onto http://www.modot.org.